The Gary Junction Road (also called the Kintore Road, Desert Road or WA Border Access Road) is now a major outback highway providing an essential link between Alice Springs and many Aboriginal communities in western area of the Northern Territory and eastern part of Western Australia, including Papunya, Kintore, Kiwikurra and Kunawaritji. The Gary Junction Road and Gary Highway are easy to confuse. The Gary Junction Road runs west from Alice Springs beyond the West MacDonnell Ranges for around 1000 km into WA. It ends at Gary Junction, near where it crosses the Canning Stock Route at Kunawaritji near Well 33. The Gary Highway leads due south for 400 km, from Gary Junction though the Gibson Desert and ends at Everard Junction on the Gunbarrel Highway. I hope that's all cleared up now. Although it follows the line of Len Beadell's original track, the Gary Junction Road has been re-graded into a wide relatively smooth gravel highway. 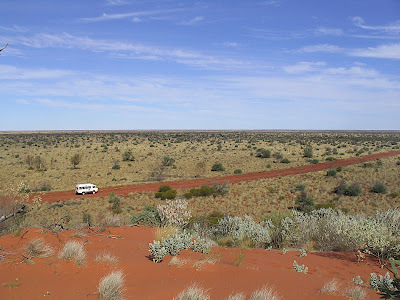 Access to this road can be via the Tanami Track, northwest of Alice Springs, or west through the MacDonnell Ranges and Haasts Bluff to Papunya. The latter route is much more interesting, but slower. 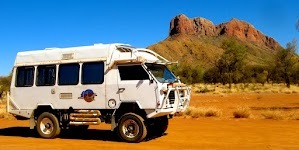 It could easily take you a week just to reach Papunya if you stop at all the best spots along the ranges. In 2007 and 2008, the Gary Junction Road was in good condition and fuel was available at the 4 Aboriginal communities scattered along its length, although getting progressively more expensive the further west you travel. A permit is required to travel this road but is easily obtained on-line. Note that actually 2 permits are required, one for the NT section and another for the WA section. One of the best and least known spots is Redbank Gorge, the last of the recognised gorges in the West MacDonnell Ranges National Park. It's west of Glen Helen and beyond the end of the bitumen but it has a nice quiet campsite as few people seem to venture that far out from Alice Springs. Haasts Bluff is an impressive rock formation at the end of Larapinta Drive at the far western end of the MacDonnell Ranges. Not surprisingly, it is an important site to the local Luritja people and is known by them as Ikuntji (Creeks Crossing). See this link. At the foot of Haasts Bluff is a memorial to Frederick Blakeley. He was an explorer and prospector of the early 1900's whose primary claim to fame was that his favoured means of transport in the outback was the bicycle, which he considered to be superior to the horse. This probably contributed to the failure of his biggest project, a 1930 expedition to rediscover Lasseters legendary gold reef. See this link. Papunya is the first large aboriginal community west from Alice Springs on the Gary Junction Road and it's curious, not for it's store or fuel pumps which are quite adequate although difficult to locate, but from the town's layout. 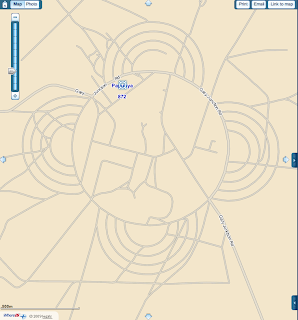 Although not obvious from the ground, the town's roads are laid out as a series of interconnecting circles and you can best see this by locating Papunya in Google Earth or Google Maps and zooming in. There appears to be only one Papunya in the world so it's easy to find. West from Papunya the road becomes a pleasant scenic drive past low mountain ranges, through green and flowering desert bushland and between delightful stands of desert oaks. It was much prettier than we had expected, the road was fairly smooth with a few patches of corrugations and we met only a handful of fellow travellers, plus a few camels. Mount Liebig is one of the highest mountains along the Gary Junction Road at 1500m and the sloping forms of the ranges look soft and mellow in the morning light. About 20 km past Mount Liebig, we come to the first of Len Beadell's plaques on this road. The exact reason for this sign escapes us as it simply says Alice Springs 204 M left, Giles 354 M right, Sandy Blight Junction 103 M right. Even in his biography, this sign is described, not by a feature such as a road junction or geographic location, but as "12M west of Mt Liebig". Once you have discovered your first marker you are henceforth on the look out for many more and there are more than 60 scattered around Len Beadell's tracks, mostly at significant points along the way. Description of LB's plaque strategy and history. Len Beadell had a strategy of erecting aluminium marker signs, or plaques, on all his tracks to indicate road junctions, prominent geographic features, major camp grounds for his working party or just as mileposts. He wanted his roads to be useful to future travellers as well as for the scientific purpose for which they were built. So, in his own words, he deliberately routed his tracks as close as possible to points of interest to future travellers and erected informative marker signs for the same reason. He would make the plaques as the roads were being built using letter punches to stamp out the information on aluminium rectangles, but without the distances marked. These would be mounted on posts, significant trees or when all else failed, on the top of 44 gallon drums. He would cut out 3 sides of a rectangle on the top of the drum and bend the flap up to hold the plaque. In the absence of a drill he would use his revolver to shoot the holes in the drum to take the nuts and bolts. Once the roads had been built, he would drive back along them measuring the exact distance on the odometer of his LandRover and fill in the missing distances. Unfortunately many of his original plaques have been souvenired, damaged or lost over the years and his family, primarily daughter Connie, has been progressively replacing them with exact replicas. Some originals have been removed for safe keeping and can be seen at Giles Meteorological Office but a few original signs still exist, mostly on his less travelled tracks. A good original example is one from 1958 on the Great Central Road, still there, no doubt, due to the 23 nails fixing it to the tree. Sandy Blight Junction marks the northern end of the Sandy Blight Junction Road which leads up from Giles on the Great Central Road. Or does it? Intriguingly, Len Beadell's party actually continued the track north from Sandy Blight Junction for a further 37 kms into uncharted desert areas for no apparent reason. The track north looks in very good condition, which is not surprising, as it leads nowhere and therefore carries no traffic. The faint red line winding north on the map below stops abruptly in a huge mess of sand dunes with no obvious destination in sight. 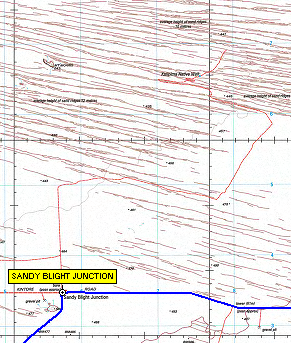 Unused track goes 37 km north from Sandy Blight Junction, but why? Why? Was he beaten by the difficulties presented by the sand dunes? Not very likely, Len Beadell was never one to give in. Was he aiming for the Aboriginal community at Nyirripi, 85 kms to the north east, and thus close the loop to Yuendumu on the Tanami Track? That's quite plausible, since on Len Beadell's original marker plaque (see below), which is now located at Giles with a replica at Sandy Blight Junction, he shows a track north to Vaughan Springs, but with no distance marked, just a blank space then "M" for miles. 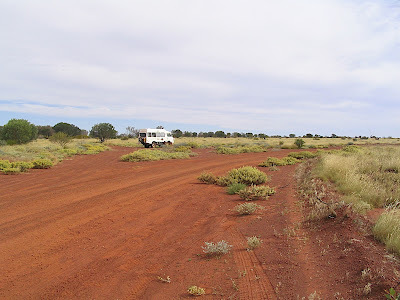 Vaughan Springs is 50 kms north east of Nyirripi in the Treuer Range, so the theory that the Sandy Blight Junction Road was eventually intended to link up with the Tanami Track seems a rational explanation. Like his other tracks, Beadell would put up plaques as the roads were built and then come back subsequently to mark actual distances on them after they were finished. This plaque was never completed. But why was the track to Vaughan Springs not completed? Maybe he was getting beyond his main geographic area of activity and was called back to more pressing work? Don't ignore the grand 4 WHEEL DRIVE ONLY sign if you feel tempted to go south down the track towards Giles and the Great Central Road, it's a quite interesting but tortuous route, and further than the 340 km the sign suggests, nearer 400 km. Also some wag had deleted the trailing zero from the other sign post. It might be 27 km to Kintore but it's certainly not 25 km from Papunya, more like 250 km. At the NT/WA border there is an original Len Beadell plaque mounted on a white painted post. Turning our watches back 1.5 hours seemed a pointless exercise out here, so we switch them off completely and relied on our biological clocks, which are quite reliable. I know when I'm hungry or tired without the aid of a watch. In November 1960, during construction of the Gary Junction Road, the team's ration truck caught fire and was totally destroyed, 51 km east of the town of Kiwikurra. A sign has been erected at the site and the partially restored truck with additional information is now housed at Kiwikurra. Reporting on the funny side of a total disaster, Len Beadell tells the story that seeing that the 1400 l water tank was boiling and set to explode, he shot a hole in the side of it with his revolver, and finding some tea leaves in the debris, made a cup of tea. The sugar had melted into the sand so it was a question of one shovelful or two? The only significant items they could recover from the wreck of the ration truck were the springs, which they subsequently removed to repair a trailer. Jupiter Well is one of those places that you always wish for and hope to find but never quite seem to. There is wide camping area is set under a large stand of swaying desert oaks with the breeze through their branches providing a soothing background sound. In the centre is a hand pump installed by a survey company in the 1960's which pumps good quality water. With good water, ample shade and a beautiful setting, we stayed for 2 nights, did some washing and wandered over the nearby sand dunes. The only downside was the number of flies about, but that's not something which is confined to Jupiter Well, and anyway we had a 2 m square pop-up screen room with us so we could sit, read and drink in the atmosphere unafflicted by wildlife. 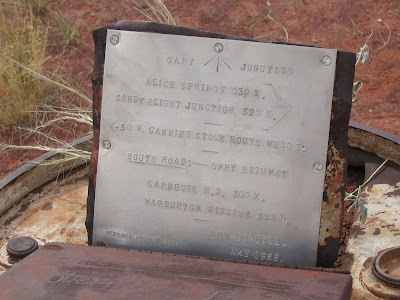 After about 1000 km from Alice Springs we reached Gary Junction, after which the road was named. This point is the junction of the Gary Highway, the Gary Junction Road, the Jenkins Track and the Callawa Track (sometimes incorrectly spelled Callowa Track). There is a Len Beadell plaque on a 44 gallon drum sitting in centre of a triangle of tracks and a visitors book in a steel box, which make interesting reading. It's amazing what innermost feelings people will blurt out in the anonymity of a visitors book, and we are no different. We really feel like we are in remote country now, with the shortest distance on the plaque being 320 MILES (500 km). Alice Springs is 630 M, Sandy Blight Junction 320 M, Carnegie Station 360 M, and Warburton 380 M. They sound a lot further converted to km. 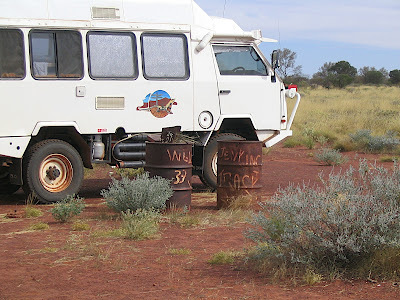 The Jenkins track is actually the continuation of the Gary Junction Road and leads the seemingly trivial distance of 50 km to the Kunawaritji community and store where it crosses the Canning Stock Route (CSR) near Well 33. Thereafter that road leads across the top of the Rudall River National Park to the Telfer Gold Mine and then on to Marble Bar. The Callawa Track is now a very overgrown and little used track, leading north to the CSR and then across the Great Sandy Desert to 80 Mile Beach, and there is a warning sign to this effect erected at the start. The Gary Junction Road was a pleasant and fairly easy trip. It was prettier and more scenic than expected and with fuel and supplies now available at the aboriginal community stores along the way it was not too risky. Of course, having got this far you still need a substantial strategy for getting on to the next destination or back home. At Gary Junction however, we branched off down the CSR on our first trip and down the Gary Highway on a subsequent trip (see Gary Highway and our 2007 Outback Trek), which are the subjects of separate articles. A good descriptive blog Danji. I believe the Len Beadell plague near Mt Leibig is for Leibig Bore. It fits the distances desribed in his books. We camped there, and there is a bore which has been a numbered Government well, however it is no longer operational nor is the water accessible. Re the road north from Sandy Blight Junction, Len writes in his book "Beating About the Bush": "Our earlier intention was to make a further 150-kilometre link northwards and eastwards to join up with the existing Tanami-Halls Creek track at Mt Doreen, but as it happened the 1000-odd kilometre access to Marble Bar became more urgently needed." He then came back to the junction and did the road east to Liebig Bore, then headed west towards Marble Bar (though it was a couple of years before he eventually made that connection). No doubt a road to Mt Doreen became something "for the future", but never completed. John, many thanks for that explanation. It's been bugging me for some time and I'm glad my basic assumptions were correct. In Len Beadell's biography "A Lifetime in the Bush", it says that the SBJR was completed on 4 July 1960 as far as "the SBJ area" but the exact location of Sandy Blight Junction itself (and hence the position of the Gary Junction Road) wasn't determined until 27 August 1960, and obviously that was south of the end of his SBJR workings. It also says "a further 16 miles (26 km) of road was constructed but never used". So now we know. The rest of 1960 was spent on the GJR east and west from SBJ. The completion of the SBJR to Mount Doreen (only 50 km NE from Vaughan Springs) on the Tanami Track presumably got overtaken by other priorities as you suggest. Pity, it would have made a pretty interesting drive.